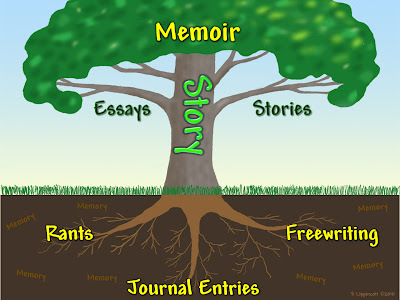 Especially during busy, turbulent times, tiny tidbits of micro-memoir in the form of write bites and sight bites can help preserve the essence of memories for future elaboration. The past several weeks have been turbulent. The turbulence began in late March when I had a diagnostic heart catheterization procedure, then learned right after that I needed a pacemaker immediately to regulate increasingly frequent skipped heartbeats. The pacemaker is working fine, but complications from the cath procedure have taken a few weeks to resolve. As all that began settling down, I had a strong sense that I needed to buy a ticket and fly up to Richland, Washington right that minute, to tell my 96-year-old father goodbye. Although I was on a plane three hours later, I did not make it in time. My brother caught me with the news just before I boarded a connecting flight in Dallas. But that was okay. We’d already said good-bye a few times. Perhaps that inner urge arose from the fact that I needed to be up there right then for an intense week of sorting things out. Sooner or later, this period of time and related events will emerge in fleshed out story form connected with memories of my dad. In the meantime, raw impressions, random thoughts, and a timeline of recent events are scribbled in my journal in a form I’m calling Write Bites. The following few are typical. I've never had such a clear sense of “before and after” as I’ve had the last four days since getting my pacemaker. Life has changed in some dramatic way I don’t yet fully fathom. I've always felt secretive about health matters. How rewarding and liberating to receive tremendous support from disclosure. I never expected to be one of those people who talk about life and death drama on a cellphone in an airport boarding area. I tried to talk quietly, but I did stay in my seat and I know a few people heard. I've seldom been as relieved as I was when I saw George's text telling me he was waiting to pick me up at the airport. I would not have to spend half an hour driving a strange car through the, confusing maze of streets to his house in the middle of the rainy night. I just realized my father was only interested in the headlines of people's lives, not the details. He was a story teller par excellence, but not a listener. I wrote a lot more than that, but I hope you can see that write bites like these are enough to take me back into the moment. They’re also enough to give those who know me some sense of what was going on. In fact, they are closely akin to Story Idea List entries, which also fall into the category of Write Bites. Another tool I used a lot was my cell camera. I snapped the sight bite picture above from my seat on the plane. 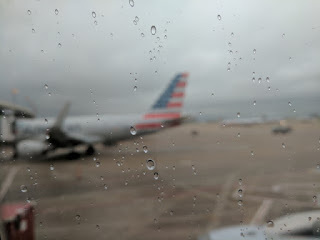 The thought Mother Nature is crying with me ran through my mind when I saw those raindrops on the window next to my seat, minutes after calling the family. The flag image in the background seemed a fitting symbol. My dad proudly retired as a Lt. Colonel from the USAF Reserves, and this picture evokes the military honors he received at his inurnment a few days later. It’s an odd photo without the story, but as a sight bite, it strongly brings back the reality of that moment. So what do you do when life gets intense? Jot a few write bites. If your journal isn't handy, use your phone or whatever you can find to write on — and/or use the camera to snap a sight bite. Someday you may want to flesh out that micro-memoir at length. Sharon, I'm on your mailing list to receive your updates, but it never occurred to me to actually stop by your blog and leave a comment! Duh! And to be truthful, I need to keep scrolling down and catch up on your blog posts. I'm sorry to hear about your father, but relieved you had already said goodbye a few times. I love your writing! Even in just these Write Bites! I haven't felt very "writerly" in a long time, and I keep saying I hope the feeling comes back, yet I haven't been jotting down any of my own "write bites." I've got a box full of scribbled notes on the backs of envelopes, etc, too. I'm sure if I began going through them again....the muse might strike! Take care of yourself and do keep us posted on your health. Hugs! Well, hey Becky, thanks for leaving a comment today! I've noticed that in general people (and I blush to admit I'm one of them) are more likely to click like buttons today than write anything, so I especially appreciate that you took the time. Thanks for the warm thoughts of all kinds. Sounds like your tattered scraps are definitely write bites, the perfect nest for a muse. May you find many blissings there. Oh wow. It has been a turbulent time for you, but your strength is such an inspiration. Oh wow. I hope that your heart is stable Sharon! I love the suggestion of writing microstories. I am a former scientist so my notes can sometimes be dry and only cover what's happening rather than capture the mood or tone.. I like your examples of write bites. I'll be incorporating that into my journaling and writing notes.